However, I am very excited to tell you that we are the first joint vision impaired and sighted group to take part in the Peak District Challenge. The aim of the project is to create awareness about walking opportunities for blind and partially sighted people, starting in East London with the view to expanding further afield. We want more people to see that being blind or partially sighted shouldn’t be a barrier to taking part in low impact exercise such as walking. We will be doing a 50k loop of the Peak District National Park starting and finishing in the small town of Hathersage on the edge of the park. The Bronze Challenge has a total ascent of 1200m and at its highest point reaches 464m. To ensure we are all prepared for the challenge, we’ll be attending Walking for Health Walks and the Rambling Association walks throughout the year, which will help increase fitness levels, but also provide opportunities to network and introduce the long term goal of the project- getting blind and partially sighted people walking and enjoying local parks and commons. Our first walk was on 8th January with the Walking for Health group in Havering. We managed 5k (3miles) in 58 minutes. So a good start to the training schedule! 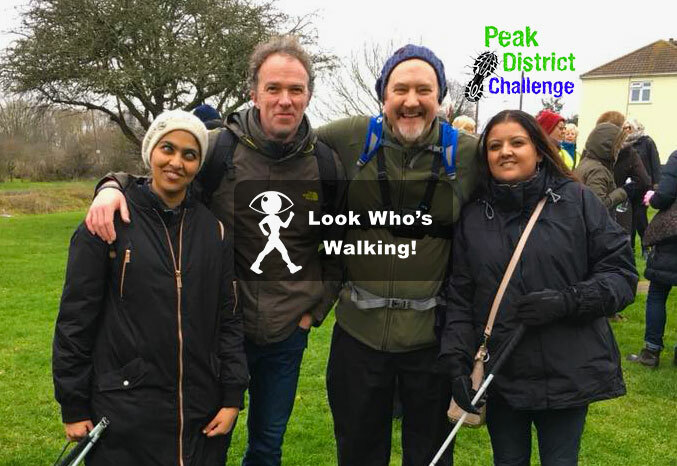 My sighted guide Ian Francis from Metro Blind Sport did a great job in guiding me, and most importantly ensured we beat our fellow Look Who’s Walking team members Bhavini Makwana and Saul Wynne to complete the walk first! I’m hopeful that we can reach our fundraising target of £5,000 and possibly exceed it.